Sport-Fit Plus Armband for iPhone 7 Plus is rated 1.4 out of 5 by 7. The high-performance Sport-Fit iPhone Armband doesn't just protect your phone while you're exercising - it's also incredibly comfortable to wear. The secure fit and slim design stays out of your way, so you forget you're even wearing it. Now you can concentrate on your workout, not your device. The Sport-Fit Armband for iPhone 7 Plus is made of a stretchy neoprene material that's breathable and hand-washable. It fits snug against your arm to give you full access to your screen without adding extra bulk. Our Sport-Fit iPhone Armband is designed so that the home button and Lightning™ port are fully accessible. You can quickly and easily operate your touchscreen while keeping your iPhone 7 Plus inside your armband and on your arm. Rated 1 out of 5 by ARol from Home button doesn't work... useless Got this months ago. Essentially useless. Once inside - you can't access your phone. Too tight also, and opening on top and buttins make it vulnerable to moisture or rain. Rated 2 out of 5 by heva from Great but home button doesnt work. I would have given this a 5 stars but for one very big flaw. The band it's self works great. The hole for the new iPhone 7 plus ear buds works perfect. The only thing and it's a big factor is that you can't use the home button. I like to look between my music and my running app and I can't do anything once I'm in motion because of this. Very disappointed. Rated 1 out of 5 by mollerdrengen from Useless armband The armband does not work with the new iphone 7/7+ homebutton. This makes the armband useless. Rated 1 out of 5 by Gary3023 from Home Button will not work!!! Don't buy! The iPhone 7 home button will not work while in this case. Very very inconvenient to use. I will be looking for an alternative. 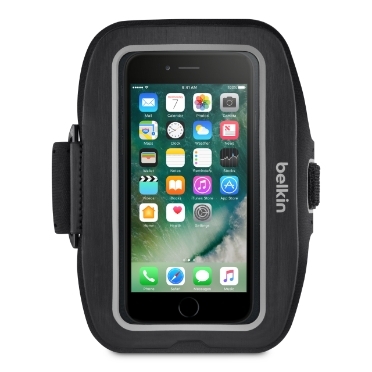 Rated 1 out of 5 by boxerdogorma from Home Button doesn't work on iPhone 7 + I bought one of these for my husband because we are participating in a 5K today. We are taking it back today because he wants to be able to operate his phone the way he normally would while wearing this armband. Also, I read the article posted the reviews. It does not work for what my husband wants to do, and if the home button doesn't work the assistive clicks won't work either. This issue really needs to be resolved. I really love Belkin and your products. I hope this can be taken care of. With that in mind, this armband works great for my iPhone 6 Plus. Rated 1 out of 5 by EmyD from Can't use home button This armband does NOT allow the home button to work on the new iPhone 7 Plus. Also have to remove from case, extremely tight fit. Not happy, probably going to return it.